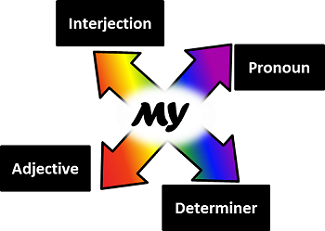 The word “my” has multiple functions in English texts and verbal communication. It can be classified as a determiner, an adjective, an interjection, or a pronoun. My science book is in the shelf. The word “my” precedes the noun “science book” to show ownership and emphasize the particular example that is being talked about in the text. When I woke up, my throat was sore. I enjoy my job very much. My! What a big farm this is! The word “my” is an interjection that somehow suggests surprise. My! how old he looks!